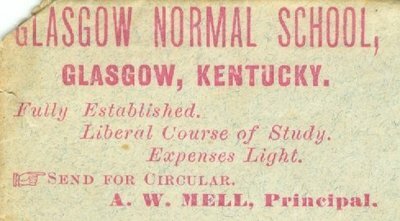 That an institution of learning is hereby established in Glasgow, Barren County, by the name and style of the Glasgow Normal School, which shall be under the control of Joseph P. Bradford, Meredith Reynolds, and W.J. Bird, and their successors, as trustees of said institution. If at any time a vacancy shall occur by death, removal, or resignation, the other trustees shall name a suitable person to fill the vacancy, they shall have power to employ such professors of learning as they may desire to teach said normal school, and may cooperate with the common school trustees, and make such arrangement as may be agreeable and advantageous to the institute hereby created and the advancement of learning; they may hold annual commencements and public examinations of the pupils, and may confer such honorary degrees and diplomas as is usual in colleges and high schools in this Commonwealth. Be it further enacted, That any graduate from said school holding a diploma, signed by its trustees or professors, shall be deemed qualified to teach any common school in this Commonwealth, and the same shall stand in lieu of a first-class first-grade certificate, as provided in article eight, chapter eighteen, of the General Statutes. Be it further enacted, that said normal school shall receive students of both sexes and any degree of advancement. Be it further enacted, that this act shall take effect from its passage.